When I first started hearing snippets about Hall’s new series I was intrigued. When I read the back cover blurb and stopped giggling I knew I had to give Prosperity a try. The blurb made me think of a playbill or a trailer for an upcoming show so I expected to settle into something wildly implausible, which would nonetheless take my imagination on a journey. And it certainly did. I will warn you that this is written in a sort of cant which took me a little bit to become accustomed to the rhythm and pattern of the narrator’s speech but once I did I didn’t have any issues understanding. Hall does have a sort of dictionary on his website under Prosperity which was fun to scroll through. Prosperity doesn’t read like most romances because Piccadilly as the narrator wasn’t really focused on a relationship but more on surviving and then recounting what happened to the skytown of Prosperity and the individuals he spent the last couple of months with. Yet threaded through his narrative and underpinning the actions of almost all the characters, including Dil, was the wish or motivation of finding love and acceptance regardless of their personal foibles. While certain actions did end up being heroic I can’t exactly call any of the characters heroes or heroines in fact I thought at least one was rather villainous but at the same time I did want them to find the love/acceptance they were searching for. Hall populated his world with a wide assortment of characters who are neatly summed up on the surface in the blurb. But as Dil came to know Miss Grey, Milord, Bryon Kae, and Ruben Crowe they became much more complicated. One of the other fascinating aspects of Dil as the narrator meant he came into the picture without much knowledge of the others’ pasts and their previously established relationships nor did he have insight into their particular motivations. I really enjoyed speculating and discovering along with him as he stumbled and bumbled but eventually put the puzzle together and managed to find his own place. Any captain could have an airship but aetherships were an entirely different matter. Aetherships had a strange symbiotic relationship to their Captains, which was only gained through a rite of passage very few survived. But those who did ended up with a ship to beat all other ships yet they were also very vulnerable because an injury to one was an injury to the other. Other skills were also in demand because the skies had to be navigated and predators avoided so anyone who could chart the skies always had a job but those who could sense the predators were feared because they were generally regarded as crazy at best crazy and dangerous at worse. Then you had those who sold their bodies for a variety of different reasons, the gambling dens, the confidence games, the crime lords, and those who tried to cater to the soul. In addition to very distinct characters, Hall’s world was also complex. 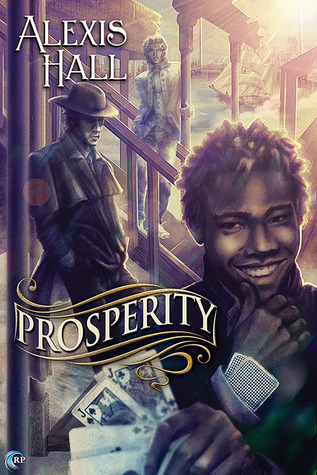 Prosperity is set in what seems to be an alternate history/fantasy mid-1800s England. England proper and the rest of the world existed but there was also a world above with skytowns, air and aetherships, clouds that supplied a minable power source, and predators from another world. The skytowns reminded me not so much as 1860s England other than the cant but more like the mostly lawless mining towns in the American West. There people gained power based on their wits and willingness to back up their words with deadly brutal force. Those without power either struggled to survive or provided an essential service and gained a sort of protection based on that service. And in just about every case there was always someone trying to take what someone else had. Prosperity was an usual read for me. I enjoyed the combination of learning the characters and discovering the world. It was fascinating to see what people would do when they had to choose between changing who they were and perhaps losing the only thing they valued. But when the choice came to losing their lives and losing the only thing they valued it was just as fascinating to see what decisions were made. While part of me wished Dil found what he was searching for I liked that the emotional action wasn’t really centered on him because it enabled me to see how the end result made sense and the quest for love and acceptance was fulfilled. Uhhhhh….how exactly is this helping the situation? You are ‘going dark” to protest an author’s stalking of a reviewer (an attempt to silence and intimidate the reviewer) by silencing your blog? If blogs shut down in response to an author’s nastiness, isn’t that kind of like giving into the bullying and harassing tactics promulgated by such people, who would like nothing more than to shut up honest reviewers? Whatever. I don’t see how punishing fans and readers of your blog is doing anything except playing into the hands of such people. @Maria: Thank you for taking the time to comment and express your feelings. We understand your frustration and between the group of reviewers here on the site we had quite a debate as we struggled to figure out a way to demonstrate we do not condone several actions that have taken place towards fellow reviewers/bloggers. We also completely understand those actions and the individuals supporting those actions are a minority among the book world. So instead of completely stopping, while we are not providing new reviews during this time period, we will have a group post that reminds us of our love of reading, books, book people, and why we started doing this in the beginning. We have gotten a brief start in the comments on this post Blogger Blackout if you wanted to provide a comment and we urge you to look at our group post going up later to comment. We hope you decide to stay with us during this time period and in the future as we work to help make the book community safe for ALL of us, not just reviewers but readers and yes, authors are readers too.